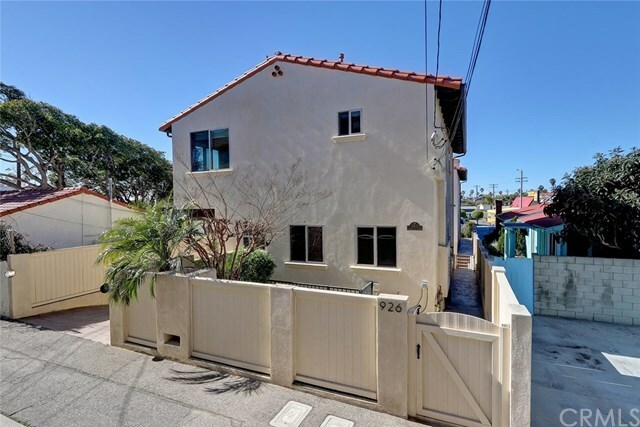 Located right off of South Redondoâs exclusive Avenueâs, this is an unbelievable opportunity to own your own townhome at the Beach. A fully detached three bedroom + office back unit with a private grassy courtyard, this home is set far off of the street offering supreme privacy. With the added feature of double dual pane windows â youâll be pleasantly surprised at the supreme quiet. With high quality finishes and brand new hardwood floors that simply sparkle, this Spanish home is full of warmth and charm. The top floor is full of natural light, with vaulted ceilings and an ideal open floor plan just right for entertaining. The cookâs wrap around kitchen is impressive with stone counters and what feels like endless cabinets! Enjoy evening dinner conversation by firelight, and your morning coffee looking at the ocean on your oversized South West facing deck. Each bedroom is a suite of its' own with a private bathroom - perfect for families, guests or roommates. And the best partâ¦the walkability! Just two short blocks to the strand, stroll the esplanade at sunset and find yourself enjoying dinner at Redondo Beachâs vibrant Riviera Village.